One of the most coveted awards in Europe, the ceremony celebrates the best new cars to be launched in the past year. The winner was chosen by an international panel of experts from nominations decided by readers of the German automotive trade magazine Auto Bild, its 20 European sister publications, and the German newspaper Bild am Sonntag. A total of 42 models competed across five categories in this year’s “Golden Steering Wheel” contest. After a Europe-wide reader survey, 20 cars made the final round and were judged by the experts: race drivers, engineers, designers, connectivity specialists, frequent drivers, critics and editors-in-chief of all European sister publications of Auto Bild. All finalist models were tested to determine which would win the popular trophy. Launched at the start of 2017, the second generation of the best-selling Audi has established several new standards in the B segment of premium SUVs. The new Audi Q5 sports the best drag coefficient in the competition. The consistent lightweight design and modern engines ensure high efficiency, enhanced further by the new quattro drive system with ultra-technology. In addition, the Audi Q5 offers a broad portfolio of new driver assist systems, modern infotainment and connectivity equipment, and air suspension with damper control. 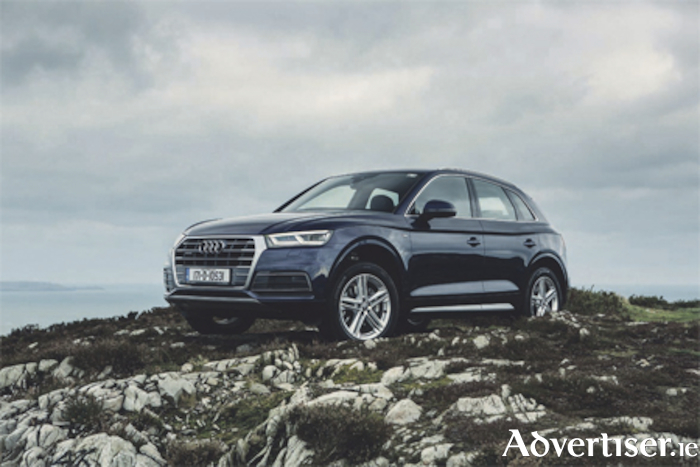 For more details on the new Q5 or to arrange a test drive, contact Audi Athlone at Michael Moore Car Sales on (090 ) 6403900.